Which B vitamins belong to the vitamin B complex? What are the signs and symptoms of a B vitamin deficiency? What is the correct dosage of B vitamins to take? Which are the ideal active ingredients and forms of vitamin B? When does it make sense to take a vitamin B complex? The B vitamins include altogether eight different vitamins, which crucially function as coenzymes in many metabolic processes. Although they are grouped together under the B complex, the eight individual B vitamins are completely independent substances. Even so, the vitamins within the B complex work very closely together. Some B vitamins are needed for the activation of other B vitamins, so that a deficiency of one may have a knock-on effect on another. A lack of a certain vitamin, as well as an imbalance in the supply can cause problems. The B vitamins belong to a category of vitamins that are water soluble. This is why they disappear in the body very quickly and must be consumed in a sufficient amount on a daily basis. To ensure a consistent supply of all B vitamins, many supplement are on sale that contain the whole complex. Whether it makes sense to take such a supplement depends, above all, on the diet of the individual; there is not always a shortage of/requirement for all the B vitamins. Even so, often a combination can be very useful. Especially in therapeutic contexts, vitamin B complexes or combinations have obtained successful outcomes. The first thing people often notice after taking a closer look at the vitamins in this group, is that their numbering is not linear. This is because some of the nutrients that were previously believed to be B vitamins are no longer counted – for example, because it has been proven that a particular vitamin can be self-produced in the body. Vitamin B11 was another name for folic acid, but today it has been internationally agreed as B9. In France, biotin is sometimes referred to as vitamin B8, but this is not in line with international nomenclature. How does Vitamin B Deficiency Occur? In order to absorb all B vitamins adequately, a very balanced diet is needed, as they are distributed across all food groups. All forms of vitamin B are water soluble. As a result, vegetables cooked in water, which are then drained, lose a large portion of their vitamin B content. What are the Symptoms of Vitamin B Deficiency? The B vitamins are involved in almost all bodily processes either directly or indirectly. Consequently, the symptoms of deficiency extend throughout the entire body. The main symptom associated with B vitamin deficiency is a dramatic loss of energy and vitality. At its most extreme, this can become seriously damaging to health or even life threatening. How common is a deficiency of the individual B vitamins? This is a difficult question to answer – firstly, as there are few major epidemiological studies; and secondly, as there is no clear definition of deficiency across the board. Studies which try to determine the supply of vitamin B through diet diaries are generally unreliable: often the information provided by participants is wrong and nothing is said about the actual intake of vitamins. Moreover, the nutrient content within foods vary greatly, as how they are cooked and prepared leads to different degrees of vitamin loss. Plus not all people can absorb nutrients equally well. Even in studies that use real blood values, the results require interpretation – not helped by the fact that in this field there are wide academic debates and many unanswered questions. Do the official scales of reference reflect realistic values ​​or are the limits too low? Why is the proportion of nutrient deficiencies many times higher if you work with reliable metabolic markers instead of serum levels? 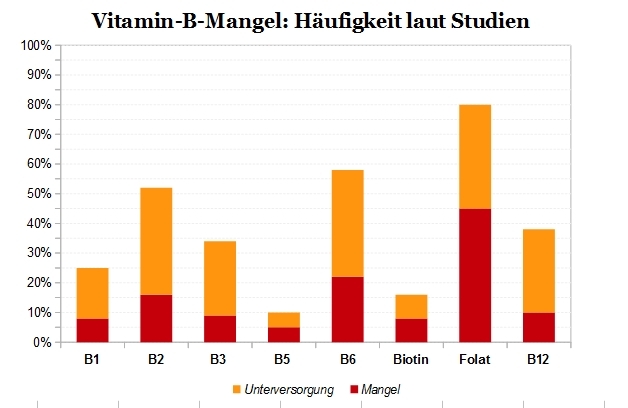 Consequently, the graph below gives only a very roughly reflection of the frequency of vitamin B deficiency, assessed on the basis of current data. B vitamins are needed to digest carbohydrates, proteins and fats and produce energy from them. Above all, they play a major role in the production of energy in the mitochondria, where they are centrally involved as coenzymes in almost all important steps. B vitamins play a central role in the synthesis and repair of DNA and cell division. The body must constantly renew all of its cells to keep the organs and tissues healthy. This regeneration occurs particularly quickly for mucous membranes, skin, hair and nails. Of course, all of the less visible organs are likewise affected. The formation of muscle and production of new blood can only occur with intact DNA synthesis and cell division. B vitamins are also central to the functions of the nerves. The B vitamins – B2, B12 and folate, as well as the “former” B vitamin choline – are central to a process known as methylation. Methylation controls countless reactions and epigenetic processes. In particular, it concerns the synthesis of hormones, neurotransmitters, growth factors and DNA – and thus many of the most fundamental metabolic processes in the body. Additionally, methylation is necessary for the production of creatine and carnitine, which have important tasks specifically in the energy metabolism. See here: Vitamin B12 and Methylation. To determine a deficiency, a vitamin B blood test is necessary. For some B vitamins, it makes more sense to measure indirect degradation products, as this can better determine cellular supply. These can also be partially determined in the urine. The below table shows the most common tests, as well as the corresponding reference scales and optimal values. The most common units are used. Sometimes alternative scales exist, which will not be shown in detail here. The most useful tests, in our opinion, are marked by an asterisk. In the following, the individual B vitamins are presented with detailed profiles. As the above profiles show, B vitamins are found across all food groups. Even so, there are very few overlaps between the individual B vitamins; a very balanced diet is necessary to absorb each one in sufficient quantities. It is not always possible to obtain all of the B vitamins through the diet – thus when there is a shortage of a particular B vitamin, supplements are usually the best way to quickly raise levels. Firstly, the number of B vitamins contained in the complex can vary a lot – not always all B vitamins are included. Moreover, in addition to the genuine B vitamins, some of the “old” B vitamins are sometimes added too, as they are closely related to the metabolism of B vitamins. Choline and inositol are especially useful here. The chemical forms of the various B vitamins are also very different. Besides supplements that use unnatural, synthetically-produced ingredients, today more natural forms can be found on the market – including the direct, bioactive coenzyme forms. We will explore the ideal active ingredients below. The final point of differentiation is, of course, dosage. B vitamin complexes are available in almost every imaginable composition. In essence, there are two main types: low dose supplements for prevention and maintenance, and high dose supplements for therapeutic use/tackling deficiency. 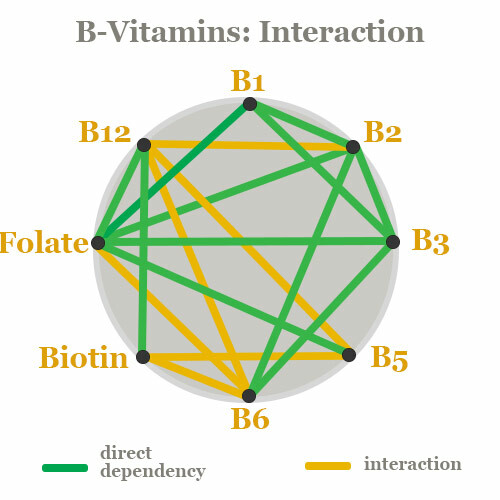 When comparing different B complexes, it soon becomes clear that the number of contained nutrients differ; while some contain only 5 nutrients, others have up to 11. This is mainly due to the fact that many supplements also include other nutrients that were previously considered B vitamins. Although we now know that these are not actually essential vitamins (because they can be produced in the body/by ever-present gut bacteria), they are so closely related to the metabolism of the B vitamins that some experts continue to recommend taking them as part of a complex. In recent years, vitamin B complexes have been criticised for containing dosages that are far too high. The “Ökotest” (eco test) Foundation in Germany, for example, have given negative evaluations of certain supplements when the dosages contained were significantly above official recommendations (1). On one hand, it is worth considering that every intake of high dose vitamins interferes with the body’s sensitive metabolic processes, which depend on a precise balance of various micronutrients. The belief that more is better is not a suitable approach to vitamin therapy, given that imbalances can so easily arise that have a knock-on effect on the body’s system. On the other hand, the practical experiences of those who have conducted vitamin therapy – as well as the research of most experts – suggest that official vitamin recommendations are often much too low to achieve positive therapeutic outcomes. Generally-speaking, a distinction should be made between dosages for preventing and treating deficiency. In both cases the current recommendations from scientific research are well above the official data on daily requirements: a therapy dose, for instance, can often be up to a thousand times more than that which is officially advised. The truth is probably somewhere in the middle – plus, the dosage should always clarify whether the supplement is for therapy or prevention. The water-soluble B vitamins are considered to be amongst the most harmless vitamins. Toxicity has only been found in vitamin B6. Whilst B5 and B3 can cause side effects in extreme doses, they are mainly considered innocuous. Extremely high dosages of B3 can also cause side effects. In the form of nicotinic acid: if more than 750 mg is consumed, skin redness, excessive urination and liver damage have been observed; more commonly after taking 3 g, heat sensation, skin redness, excessive urination and liver damage occur. These symptoms are known as “niacin flush”. Significantly fewer side effects occur when the form called nicotinamide is taken, which is now commonly used in dietary supplements. Even so, from extremely high doses of 3 g per day – nausea, vomiting and signs of liver poisoning have been witnessed. B Vitamins – is Neon Yellow Urine Dangerous? B2 (contained in vitamin B complexes) is a natural dye and turns urine neon yellow, which some people mistakenly consider to be an indication of dangerous side effects. However, this is just the excess of the vitamin being excreted in the urine. Soon after, the colour of the urine normalises again – so whilst this bright colour may come as a shock, it is harmless. Many vitamin B complex supplements contain synthetically produced vitamins, which do not occur in foods or in the body in such chemical or isolated forms. Some critics believe that synthetic vitamins do not have the same effects as natural B vitamins found in foods. Only a handful of supplements on the market actually contain natural B vitamins from naturally growing plants. This kind of extraction is very costly/time consuming and only very low dosages can be obtained. Supplements containing such B vitamins are therefore only good for prevention and maintenance, as it is difficult to obtain the high concentrations required for vitamin B therapy through natural means. A larger number of supplements use quinoa or yeast cultures, which are bred with a nutrient culture of (mostly synthetic) B vitamins. The quinoa/yeast absorbs these vitamins and can then be harvested and marketed as a natural source of B vitamins, yet whether this method is really comparable to natural sources of B vitamins is debatable. Also under the umbrella term of “natural B vitamins” are the natural coenzyme forms – regardless of whether they are produced synthetically or not. Since they are absolutely bioidentical to the coenzymes naturally formed in the body, an identical biological effect is assumed. Many synthetic B vitamins – but also some natural B vitamins from foods – have to be converted by the body into their active coenzyme forms. Supplements that use the active B vitamin forms may therefore have a better efficacy because they directly deliver the form that is metabolised by the body. How Useful are Vitamin B Complex Supplements? The vitamins belonging to the B group are found in many foods. Nonetheless, a supply is not always guaranteed, due to dietary choices and requirements. Only those who eat a very well balanced diet – paying close attention to obtaining a mix of animal products, vegetables, nuts and legumes – can safely meet their vitamin B needs though food alone. Since the vitamins of the B complex are extremely important and almost completely risk-free, a vitamin B complex can be a very useful nutritional supplement. For all the symptoms listed above, a supplement is especially advisable. When selecting the right product, it should be clear on the label which type of dosage is contained (prevention or therapy) and, if possible, B vitamins from natural sources and/or in the active coenzyme forms should be selected. In case of any doubt, a doctor, alternative health practitioner or nutrition expert should be consulted. Bender DA. Vitamin B6 requirements and recommendations. Eur J Clin Nutr. 1989 May;43(5):289-309. Review. PubMed PMID: 2661220. Knopp RH. Evaluating niacin in its various forms. Am J Cardiol. 2000; 86(12A):51L–56L.